Let’s just skip right to the chase here: Diablo 3 (D3) on the console is, in my opinion, superior in just about every way to the PC version. It’s necessary that I emphasize the weight behind that statement, as someone who still considers herself a PC gamer and has a long history with Diablo 2. 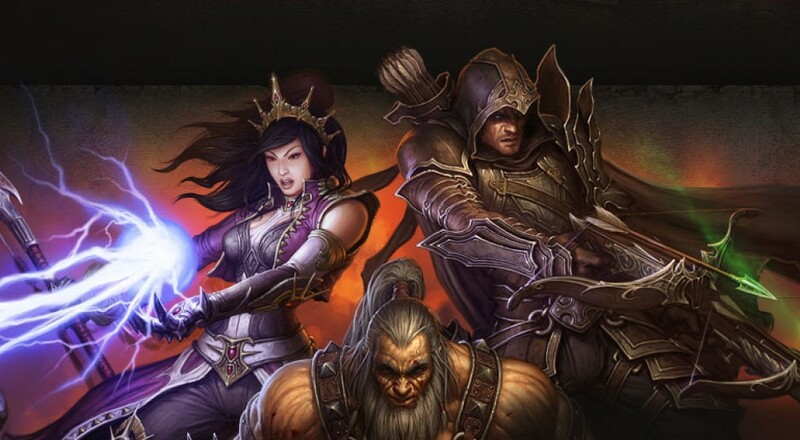 Playing D3 on the console takes me back to some classic console ARPGs like Gauntlet, Baldur’s Gate: Dark Alliance, and Champions of Norrath - all games that have been heralded as great couch co-op games. Like all of those games, D3 supports local (yes, optionally offline!) shared-screen co-op with up to four players, but it also supports online and combo co-op as well! 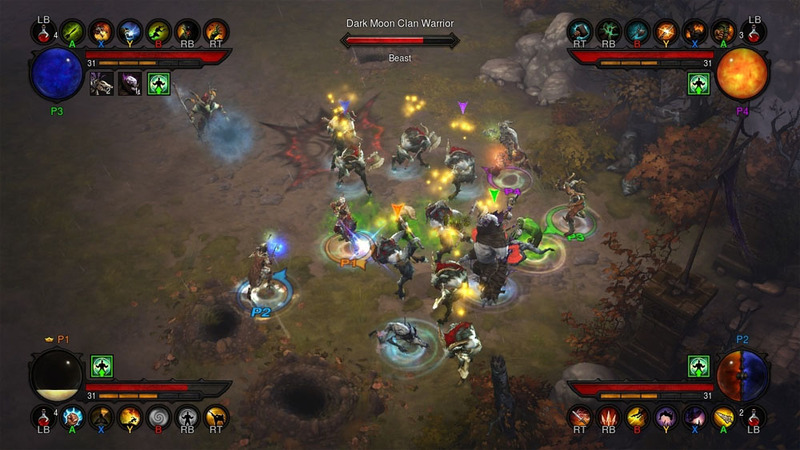 While shared-screen can be pretty hit-or-miss in ARPGs, D3 has implemented it fantastically. When players start to split up, the camera slowly begins to zoom out. Eventually it won’t be able to zoom out anymore, and players are stuck on that screen, but it hardly ever feels super restrictive. Furthermore, if someone puts down their controller to grab a snack, his or her character will follow around the other party members automatically or teleport to them if he or she gets too far away. Players connecting to the game online are not tethered to shared-screen whatsoever. I played a good amount of Diablo 3 on the PC launch, and while I can safely say that the game’s the same as far as story, classes, etc., the console version has completely redesigned many aspects from the ground up. Most apparent is the interface. We all know that a poorly designed console interface for an ARPG can be an absolute nightmare; happily, D3’s interface (utilizing radial menus as well as lists) is easy to navigate and use. The console version ditched the whole “size” concept of items to help accomplish this. Polearms now take up exactly the same space in your inventory as rings. I know. Your mind has been blown. Speaking of items, the item drop system has been completely redesigned as well for the console version. 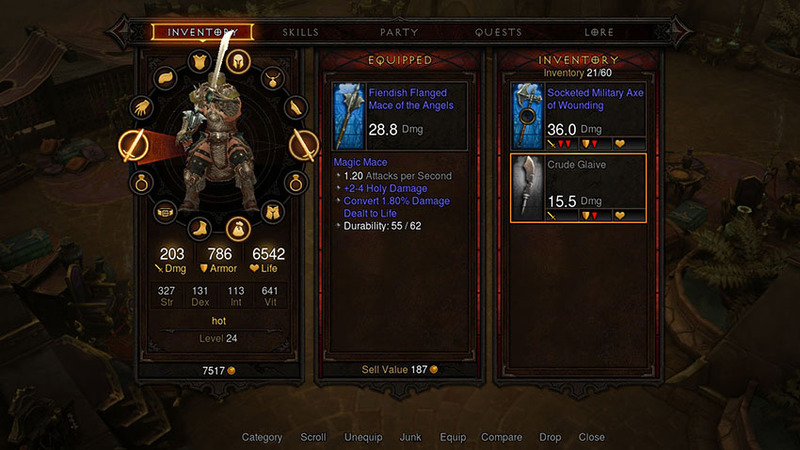 Less items drop, but the items that do drop are of higher quality and more tailored to the classes in the party. My party was getting 2-3 legendary items an hour and almost all of them were immediately useful (or duplicates, which were immediately sequestered for alts). Let me pause for a second while you pick up little pieces of your brain from the floor. Since there’s no auction house in the console version (please, keep your cheering down for a moment), players have to be able to get by on the drops they get in their own games. For players on the same console, drops are shared so anyone can pick them up and trade as needed. Players connecting into the same game over the internet won’t see those drops and will instead receive their own set of drops.